Among other things, Moradabad is known for its e-waste recycling industry. The city is located on the banks of the Ramganga, an important tributary of the Ganga. Now a study by New Delhi-based non-profit Centre for Science and Environment (CSE) on e-waste in Moradabad has found that the level of heavy metal contamination in areas in and around the city is extremely high. CSE collected soil and water samples from five locations along the river. The water is used for washing by city residents and for drinking in downstream areas. Since there are no standards to study heavy metal contamination of soil in India, CSE compared the results to Canadian and US Environmental Protection Agency (USEPA) standards. A soil sample collected one kilometre from the river was found to have zinc levels 15 times more than the USEPA standards, while copper levels were five times higher (See graph: 'Recycled mess'). Chromium level in a soil sample collected from the riverbed was twice the Canadian standard, while cadmium was 1.3 times. The results were similar for the water samples. 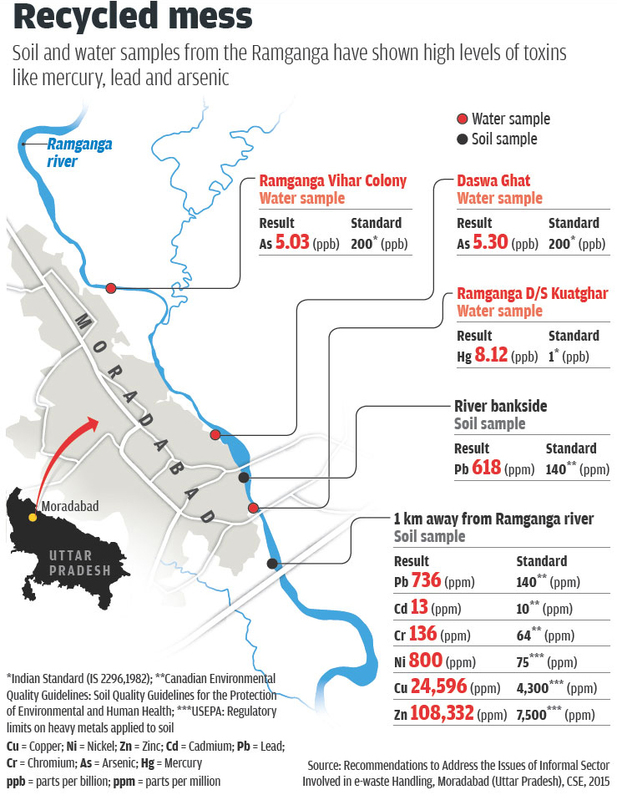 Mercury levels in samples taken from the Ramganga were eight times higher than the Indian standard. Traces of arsenic, too, were found in the samples. CSE collected samples from Nawabpura, Karula, Daswaghat and Rehmat Nagar­—localities where a vast majority of the population is involved in handling e-waste—and Bhojpur, a neighbouring village which is also a major e-waste handling centre. These samples were tested at CSE’S Pollution Monitoring Laboratory in New Delhi. “Fifty per cent of all PCBs used in India end up in Moradabad. The city gets about nine tonnes of e-waste each day,” says Deepak Agarwal, Moradabad's district magistrate. 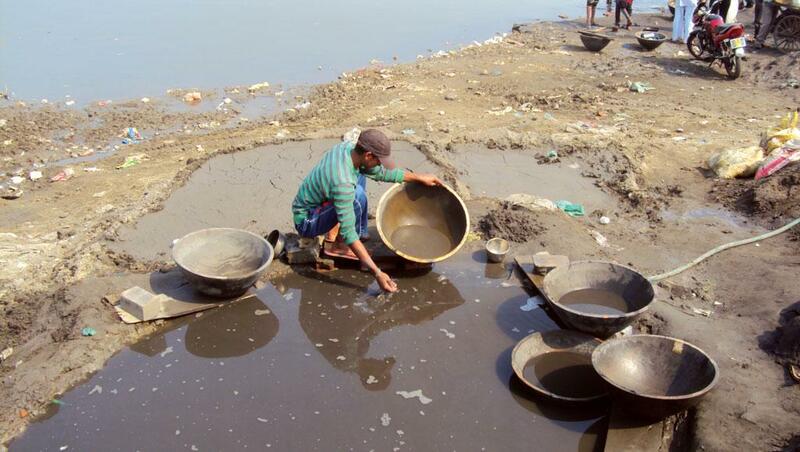 Charu Gangwar, a researcher working on e-waste at Moradabad’s Institute of Foreign Trade and Management (IFTM) University, says that all e-waste recycling activities along the ghats of the Ramganga release gases, acid solutions, toxic smoke and ash. These contain heavy metals which are dangerous to the environment and can cause serious ailments, including cancer. Chemicals from e-waste can also pass through the ground and contaminate the soil and groundwater, she adds. “High levels of mercury and arsenic can lead to chronic poisoning. Tests to detect such poisoning are usually expensive and nobody gets them done,” says Navneet Agarwal, director, Asian Hospital in Moradabad. Mercury enters the foodchain through bio-accumulation in fish and other aquatic life forms. It is a known neurotoxin and interferes with the proper functioning of the brain and the nervous system. However, ailments caused by heavy metal pollution go unreported or undetected. “High levels of zinc, cobalt and nickel do not have any reported clinical problems, but they may lead to sub-clinical problems which cannot be detected on the basis of symptoms, but persist,” says Mukesh Raizada, a city-based general physician. There have been no studies or health assessments to correlate increased respiratory diseases and e-waste activities in the city, says Agarwal. “But there has been an increase in respiratory disorder cases among people living in areas where dismantling and segregation of PBCs (printed circuit boards found in e-waste) is done,” he says. He adds that the poor do not go to doctors easily and, therefore, it is difficult to establish the health impacts caused by e-waste-related work. “I have been doing research on the health hazards related to e-waste for the past five years and, as per our primary health surveys, 80 per cent of the ailments in Moradabad are respiratory and lung-related,” says Anamika Tripathi, professor at Hindu College, Moradabad. The process of dismantling and recycling e-waste is commonly done in household basements and workers inhale the toxic gases released in the process. Experts say that since most of the e-waste recycling in Moradabad is illegal, no safety standards are followed, and dismantling and recycling methods are crude. As a result, 40-50 per cent of metals are left unextracted and cause contamination. With such huge amounts of e-waste being dumped in the city, structural mechanisms are needed to deal with the problem. The CSE study says that manufacturers have to be held liable for contamination caused by their products. “As long as the producers of electronics do not take the responsibility of their products, the e-waste will continue to find its way to the informal sector and ultimately to Moradabad,” it states. CSE has also suggested that apart from promoting Moradabad as a brass hub, the government should promote it as an e-waste/PCB waste-dismantling centre. Such a move will ensure that the business becomes legal and working conditions are made safer. This could also help bring investment to the city. A complete ban on open burning of e-waste on the Ramganga riverbank would also help check contamination, says the report. “The country does not even have soil contamination norms or standards. We need to develop them to gauge the level of pollution in cities like Moradabad. There is also a need to monitor all riverside activities on the Ramganga river,” concludes Rama-kant Sahu, deputy head of CSE’s Pollution Monitoring Laboratory.